Amiibo collectors who purchased a Skylanders Superchargers starter pack for the Wii U, Wii or 3DS solely to acquire the exclusive Bowser and Donkey Kong combo figures are kicking themselves right now. The most recent installment of the Skylanders toys-to-life franchise piggybacked on Nintendo’s Amiibo craze to create an exclusive pair of figures that allows players to switch between Skylanders and Amiibo functionality. In Skylanders mode they can hop into the Nintendo versions of the game, gain experience points, drive their signature vehicles and otherwise look out of place. In Amiibo mode they register as the same characters from the Smash Bros. line. 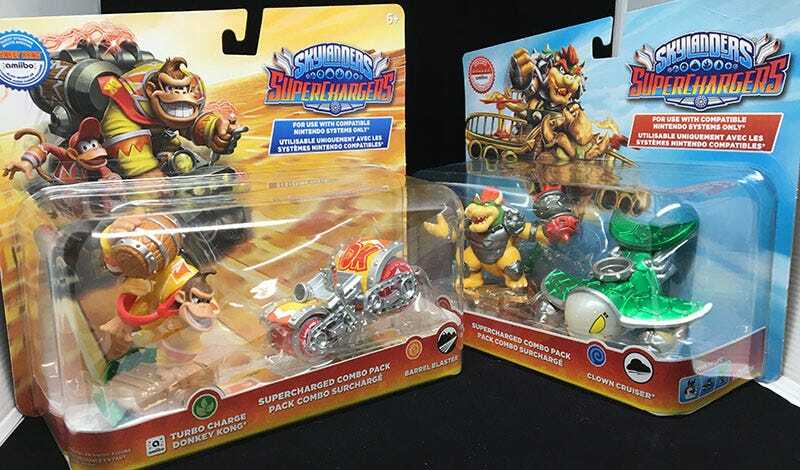 Since the characters and their corresponding vehicles only worked in the Nintendo versions of Superchargers, they were only available in the starter packs at launch—Donkey Kong and his Barrel Blaster in the Wii U version, and Bowser with his Clown Cruiser in the Wii and 3DS games. I personally know several Amiibo collecting fans that spent $75 each on two starter packs just to secure these figures. This post is dedicated to the memory of their additional $100. The pair are now available bundled with their respective vehicles in $24.99 packs, clearly labeled as “For Use With Compatible Nintendo Systems Only” to avoid confusion. Shame is not so easily avoided.